After hitting the snooze button approximately 4 times, head to Stanstead Airport outside of London for an early flight to Porto. Arrive midday and take the metro from the airport to the city center. We purchase a ticket just inside the station and then hop on the purple line. Just remember to validate ticket before getting on the train! With our suitcases in tow, we walk a short distance from the station to our hotel, the Mercador Guesthouse. Our host welcomes us in the breakfast room and offers us complimentary (and much needed!) coffees as we check in. As neither Supal or I have been to Porto before, he tells us a bit about the city, its history and how it’s represented by each of the hotel’s seven rooms. This grand eighteenth century residence has been turned into a boutique hotel that celebrates Portugal’s rich history. 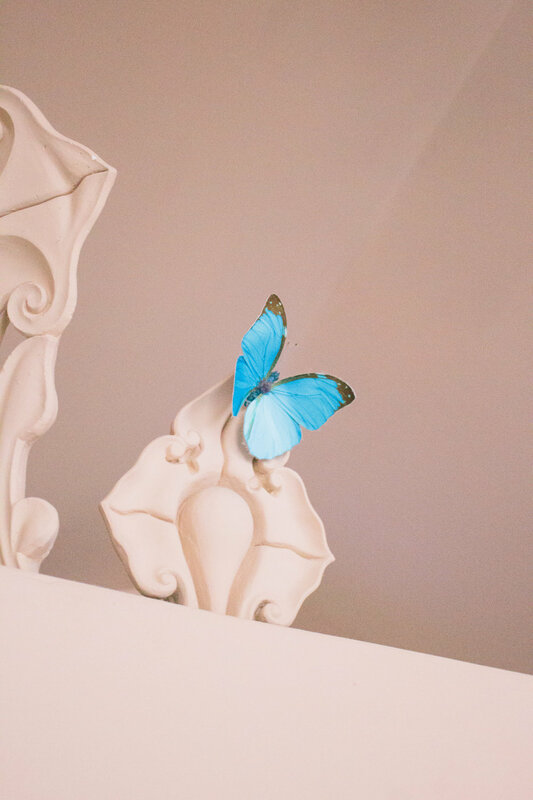 Each of the seven rooms is named after a historic Portuguese port city and beautifully decorated to match—we stayed in Macau. 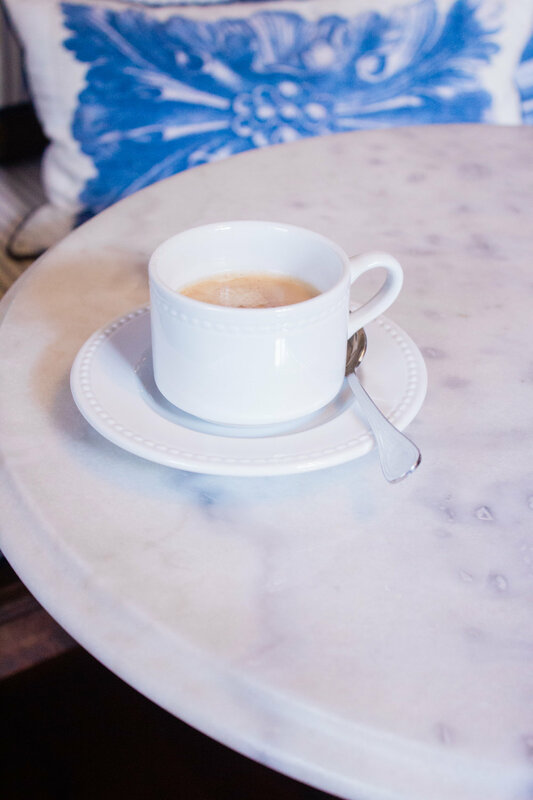 Upon arrival, you’re welcomed with coffee and soft music (can every hotel do this?) plus a detailed map of the city. The hotel is located in the vibrant arts district and a short walk from Porto’s most famous spots. He then takes us through a map of the city, pointing out where to go, where to avoid, and of course, where to eat! Despite us bringing the rain from London, we’re excited to go out and about for our first bit of sightseeing and the famed azulejo tiled churches are at the top of our list! We take a bus towards the Chapel of Souls Church (Capela Das Almas) first and even in the rain, it’s stunning. The blue and white tiles are worth a close look, but it’s also worth standing opposite the church to take in a full view of their scale. Nearby is the Igreja Paroquial de Santo Ildefonso, another church covered in the azulejo tiles. This one happened to be surrounded by cranes doing repairs, but that didn’t take away from the beauty. We take a moment to step in to look at the deep colors are such a contrast from the blue and white exterior. All the traveling and wandering in the rain has us hungry, so we take make a quick stop to A Perola do Bolhao for a quick chocolate souvenir (this family-run food shop was so lovely, they even let us try a couple of figs for free!) before looking for Portugal’s famed nata pastries. We find them at Nata Lisboa and gosh they’re good. I don’t tend to eat much dairy and I thought I didn’t like custard, but these change my mind. Topped with cinnamon, it’s a real treat and I’m determined to find them in London now! Now that we’ve got some food in our stomachs, we decide to have a drink before dinner. We spotted Livraria da Baixa earlier in the day and it was so cute we knew we needed to go back later in the evening. It’s kitschy in the best possible way and the Duoro wine is incredible (and incredibly inexpensive!). The fact that they had ceramic black cats made this spot that much better! We had intended to eat a traditional Portuguese meal for our first night, but we (well, I) did not do nearly enough research to locate one that had veggie options! So we opt for Italian at Puro 4050 and I’m so glad we did. The food was incredible and I know Supal is already figuring out how to recreate their piquillo peppers. We get veggie starters, focaccia pizzas and wash it down with Duoro valley rose. When in Porto! We spy that outside it’s raining cats and dogs and realize an Uber is only three euros, so we decide that it’s a much better alternative than walking back to our hotel in the rain! Can it be that cheap in London, please? It’s off to bed straight away as we’ve both been up since about four am! Our hotel includes breakfast which is served during set hours, but we’re up a bit before that. Lucky for us, the hotel keeps tea, coffee and a few snacks set out at all times, so we help ourselves to some while getting ready and doing a bit of work. Before heading out, we sit down for a proper breakfast in the hotel, which includes freshly-baked breads, cheeses, yogurts and coffee made-to-order. I always opt for an espresso! Out the door we go towards Igreja do Carmo, which we found to be the most stunning example of the blue-tiled churches. The beauty is stunning and we spent plenty of time admiring (and photographing) this breathtaking building. And lucky for us, the sun came out which made it all the more beautiful. Side note: nearby is Livraria Lello and this is a firm skip! You can see the famed staircase from outside, so why wait in line for entry (which you have to pay for) to this crowded attraction? But just down the street is A Vida Portuguesa—by far my favorite shop that we found. It’s housed in an airy old building and features so many treasures. I could (and we do) spend a lot of time in here, just looking at all of the locally made ceramics, foods, art, and much much more. I spy a ceramic crow which I know I’ll return to buy a little later! Next up is Clergios Church, a beautiful stone building. I’m particularly a fan of the intricately carved doors painted in a gorgeous grey. Since the sun has really started to shine, we decide to pop by the room to change before heading out for the second half of our day. I’ll be very honest and say that Porto is certainly not the most vegetarian-friendly city I’ve ever visited. Sure there are some delicious options, but one can’t subsist on nata alone, so we ask my friend Lindsay for a vegan recommendation. She points us to daTerra, which is a buffet-style place (akin to Ottolenghi in London) where we fill up on the most delicious (and healthy) vegan dishes. 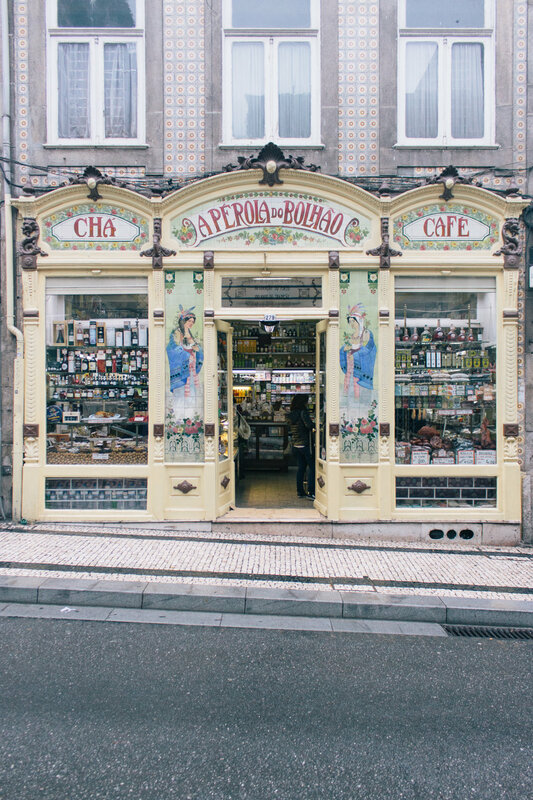 Properly fueled, we hit the hilly streets of Porto to find a few more attractions. First up is Sao Bento train station which feels like you’ve been transported back to the past when train travel was a glamorous activity. Look up for the most stunning ceilings! 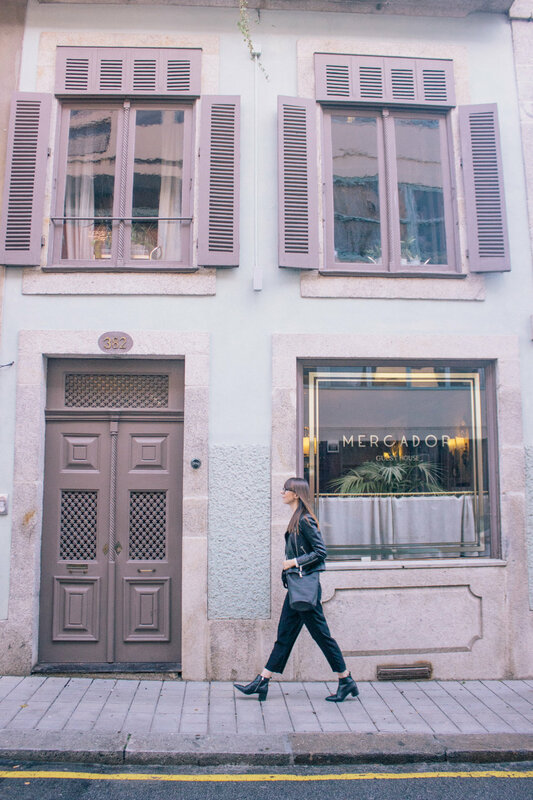 Wanting to make our way slowly down towards the river, we walk downhill on Rua das Flores, a pedestrian street lined with some of Porto’s most iconic shops. These include Claus, whose beautiful packaging transports you back through the years. Began in the late 19th century, this brand specializes in soaps, creams and fragrance. If you’re looking for a gift to bring back for a loved one, I think this is the spot to get it. I loved their candles, but didn’t quite have room in my suitcase! Upstairs there’s a small museum that tells the history of the brand, with examples of their packaging throughout the years. I love the deco styles of the thirties in particular! Nearby is Paco Episcopal do Porto, a palace with beautiful Baroque architecture, which we briefly admire. We’re finally to the river, and as the hotel warned us, it is a bit touristy. We found other parts of the city to be much more charming, though it’s worthwhile to head to this area once for the dramatic view of the city’s bridges. Porto, though hilly, is actually a fairly compact city and you can easily cross it in half an hour (or less). Wanting to rest a bit and then change before dinner, we walk uphill towards the hotel. Our room includes a complimentary bottle of Churchill’s Port (which is by far the best I’ve ever tasted), so we have a bit as we get dressed for dinner. Back towards the river we go (this time via Uber) for Jimão Tapas e Vinhas, which beautifully blends Spanish and Portuguese flavors for a really special dining experience. I’m really fond of their asparagus and Manchego toast which I really want to recreate at home! And of course we have to indulge in a bit more Duoro wine because it’s just too good to pass up. After a filling dinner we decide to Uber home rather than brave the hills, then it’s off to bed! We did so much the day before, so we take out time and wake up slowly—no alarms today! After packing up our bags, we head down for breakfast. It’s an espresso again for me plus some more of the homemade treats that are just too tempting to pass up! As we’re finishing up, our host kindly checks in on us and offers to show us a few more of the hotel’s rooms. It’s such a treat! Each is named for a historic Portuguese port city and the decor reflects this. And we learn that the hotel is Farrow and Ball’s only official partner in Portugal, so the hotel is only painted with their beautiful shades. Finished up, we check out and leave our bags with the hotel to squeeze in a bit more exploring. I’d heard of Majestic Cafe when researching for our trip, so we stop in for one last nata. In all honestly, they’re nothing special (and much more expensive than anywhere else), but I found it worthwhile just so we could sit in the beautiful Belle Epoque interiors. Because I can’t get that ceramic crow off my mind, we go back to A Vida Portuguesa so I can buy it. It now sits proudly in our living room! One last leisurely stroll around the city and then we’re off to the airport via the metro. It’s been such a special trip, not just because we were able to see so much. The people that we met throughout our stay made it all the more memorable. Porto’s residents are so proud of their city and their enthusiasm and willingness to share made our time here one I’ll treasure.